The Alarm Indicator panel M4700 is intended for status indication of any process providing on/off outputs. The panel contain 6, 8 or 20 channels, respectively. 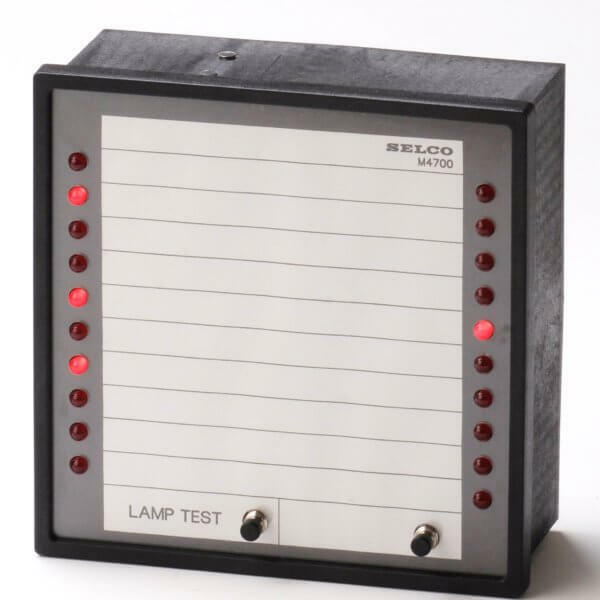 The Alarm Indicator, M4700 provide flush mounted LED based indication with 20 channels. Each channel can be used to indicate the state of one potential free contact. All SELCO indicator units are available with either negative or positive reference. An insert paper label provides the opportunity to print a description or instruction right next to the related channel LED. The SELCO indicator units are available for both DC of AC supply. Input signals can be +24 VDC, +48 VDC or +110 VDC. The indicator panel is also equipped with an alarm relay, a siren relay and a built-in siren. A TEST push button located on the front will, while activated, ignite all LEDs to confirm proper operation. An auxiliary push button is provided for application dependant use. The auxiliary push button is directly connected to the plug-in terminals on the rear side of the unit.